General Mills, Inc. is a manufacturer and marketer of branded consumer foods sold through retail stores. The Company is a supplier of branded and unbranded food products to the North American foodservice and commercial baking industries. The Company has three segments: U.S. Retail, International, and Convenience Stores and Foodservice. General Mills is a dividend achiever which has increased dividends to shareholders for 14 years in a row. The company and its predecessors have paid dividends without interruption for 119 years. Over the past decade, General Mills has managed to hike annual dividends at a rate of 10.40%/year. The stock is down in recent months, and appears to be attractively valued at 16.70 times forward earnings and a dividend yield of 3.80%. This review is in sharp contrast to the review we did last year, when the stock was overvalued at 23 times expected earnings. 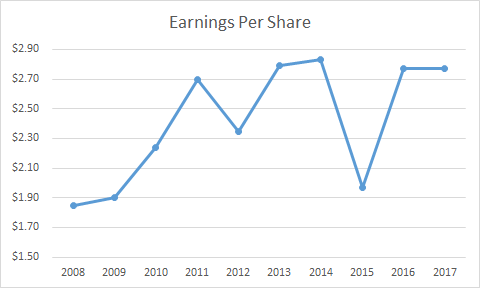 When we look at the trend in earnings per share, we can see that EPS peaked at $2.70 in 2011. We have not seen any material earnings per share growth since then. The company earned $2.77/share in the past year. Most of the earnings growth over the past decade occurred between 2008 and 2011, when earnings per share grew from $1.85 to $2.70/share. 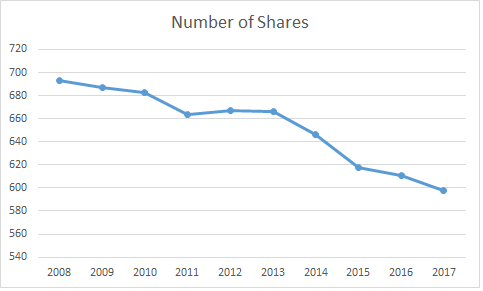 This lack of earnings growth is unfortunate, because the company reduced the number of shares outstanding from 664 million in 2011 to 587 million in 2017. If General Mills had not repurchased any stock, earnings per share would have been lower. To add insult to injury, it looks like a large portion of the stock was bought at prices that were above today’s share price. I believe that shareholders would have been better off with a special dividend, rather than share buybacks. General Mills is expected to earn $3.08/share in 2017. However, Wall Street estimates on near term earnings growth have been inflated and incorrect for several years in a row. Looking at my analyses of the company, I can see forward earnings estimates at $3/share for three – four years in a row now. 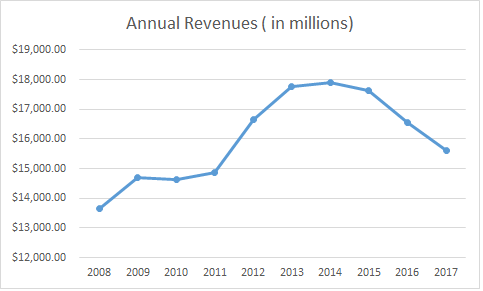 Unfortunately, revenues have declined to $15.6 billion in 2017, which is down from a peak of $17.9 billion in 2014. Many traditional consumer staples companies are feeling the pain from increased competition today. I still think that strong brands have a high perceived value by consumers, which would drive repetitive purchasing behavior. Unfortunately, a lot of work needs to be done to reinvigorate those brands, invest in marketing, and drive sales and profits higher. The dividend does not seem adequately covered based on prior year earnings. 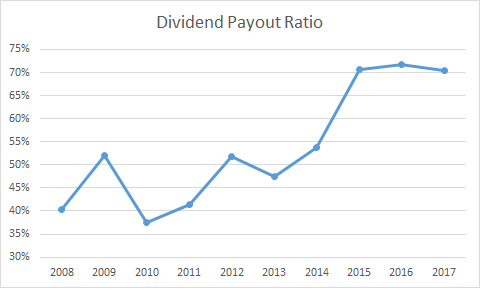 The dividend payout ratio is at 70%. 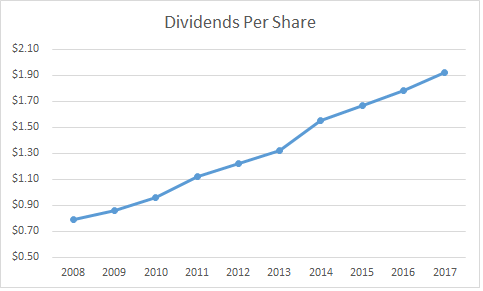 There is very little room for further dividend increases, due to stagnating earnings per share. You may like this article, to see a broad overview of what I look for when determining dividend safety. Even if General Mills does manage to earn $3.08/share in 2017, the payout ratio is still a little high at around 63% - 64%. However, this is more manageable. I doubt that the dividend will be cut in the near future. Without earnings growth, future dividend increases will be limited. This was evidenced in the last quarterly dividend increase, which was only 2%. This is significantly below the ten year average of 10%/year. Again, without growth in earnings, we won’t be able to see a sustained increase in intrinsic value for the business. The valuation is attractive at roughly 16.80 times forward earnings. The yield is also attractive at roughly 3.80%. That means that changes in the share price will still occur due to the perceptions of the stock market. The stock price can easily rebound to $60 from here if the situation turns around. Or the stock price could easily drop to $40 from here, if investor perceptions turn sour. However, we are not in the business of forecasting stock market prices. Therefore, I do not have an opinion on General Mills, until they get their act together and kickstart earnings growth. I believe that the company is not going anywhere. As a holder of General Mills, I will keep holding to my shares. But I am not sure I will be adding to my holdings today. That being said, even if earnings per share remain flat for the next decade, you can still earn a 4% return, as long as the dividend is maintained. Ironically, this is in line with future returns on US stocks. For example, Jack Bogle who is the founder of Vanguard Group, expects annual returns of 4%/year from US stocks. What is your opinion on General Mills? I look forward to hearing from you at dividendgrowthinvestor at gmail dot com.